India 124/8 chasing 216 for victory. With all hopes of a victory extinguished, its that man again who rises to the occasion. That same man who has bailed India out of sticky situations in the past. That same man who has dug his team out of a hole innumerable times. That same man who thrives under pressure. That same man who delivers when the chips are down. That same man who is Very Very Special. VVS Laxman did it again. I’ve lost count of the number of times Laxman has bailed India out of a hopeless situation. W hen Tendulkar fell before Lunch, my heart sank and when Dhoni and Harbhajan too got out cheaply leaving India teetering at 124/8, I gave up all hope. However, the wizard with the magic wand turned it around completely in Ishant Sharma’s company. A lot of credit should also go to Ishant for his dour batting. Critics are hailing him for the good judgment he demonstrated in leaving the balls outside the off stump. However, what is more laudable is his temperament and strength of character that he showed in adverse conditions. I’m sure, a lot of it had to do with Laxman’s assured presence at the other end. He was encouraging Ishant throughout and as he himself said later, he ’empowered’ the batsman at the other end by letting him take responsibility. Leadership Development is an area close to my heart and Laxman is a living case study on effective leadership. Leadership gets tested in times of crisis. We witnessed the fall of many business leaders during the recession. These leaders wilted under pressure. Maybe they should take a leaf out of Laxman’s book. Pressure brings out the best in him. Edgar Schein, the change management guru , expounded on the theory of Career Anchors. A Career Anchor is a combination of perceived areas of competence, motives, and values that one would not give up; it represents one’s real self. 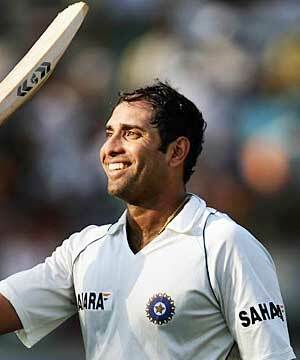 It is easy to spot Laxman’s top career anchor – Pure Challenge. Give him a hopeless, almost impossible situation, and he will take it upon himself to turn it around. Recently, I read an article on Laxman which described him as steel wrapped in silk. Spot on I say. Since that historic test of 2001, which will forever be etched in the memory of every cricket lover in India, Laxman has produced innings of such brilliance with remarkable regularity. He loves to win, and the Australians will vouch for this, loves it even more if the win looks impossible. It is not for nothing that they call him Very Very Special Laxman.